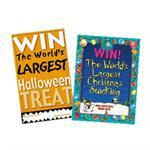 Giant Halloween Promotions Draw Customers In! Promotion will pay for itself through extra business and free publicity. Have your local paper photograph the lucky winner with this giant prize. Great for customer relations. You will receive everything you need to run a successful in-store contest. Giant Promotion will arrive completely assembled. Due to the large size of the Giant Promotions, the shipping for these promotions may not calculate correctly on the website. We reserve the right to contact you with the correct shipping charges prior to processing your order. You can always call for a shipping quote prior to placing your order. Package of 1000 extra entry blanks. Compatible with all of our Giant Seasonal Promotions. Need a few more window signs? These colorful window signs will let your customers know about your Giant Promotion Give-Away. 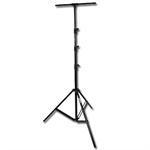 Extending Tripod Stand for Giant Promotions.